Morphological and physiological parameters of polyethylene glycol (PEG)-induced drought-stressed Thymus vulgaris L. (thyme) seedlings were examined. 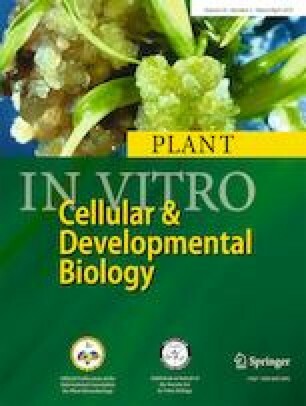 To start in vitro selection for drought stress tolerance and to provide a more efficient method for the production of pharmaceutical substances, callus induction and production of essential oils were analyzed. Thyme seeds were germinated on medium containing 0, 2, 4, 6, and 8% (w/v) PEG; and, for callus induction, stem explants were cultured on medium supplemented with 1 mg L−1 2,4-dichlorophenoxyacetic acid with different concentrations of PEG. Four weeks after PEG-induced water stress, a significant decrease in seedling growth, chlorophyll and carotenoid contents, and callus weight and induction was observed. However, no significant difference was found in the germination rate of seeds. Organic osmolytes, e.g., proline and carbohydrates, were influenced by PEG-induced osmotic stress. Reducing sugars progressively increased with rising PEG concentrations, while proline levels largely decreased under severe water stress. Moreover, PEG decreased the anthocyanin content but raised reactive oxygen species (ROS), lipid peroxidation, proteins, and phenolic compound levels. Additionally, PEG induced a substantial change in the activities of antioxidant enzymes. Positive relationships between ascorbate peroxidase activity and formation of ROS in PEG-treated thyme seedlings were detected. Furthermore, PEG changed the essential oil composition in seedlings and calluses by significantly increasing γ-terpinene, p-cymene, and geraniol but decreasing thymol and carvacrol. Thus, mild stress levels increased phenolics and oil components in thyme, despite the extent of oxidative injury and growth reduction, which could enhance secondary metabolite production in vitro.